A new film book called When Animals Attack: The 70 Best Horror Movies With Killer Animals, has just become available in paperback and Kindle format. And it’s a lot of fun! 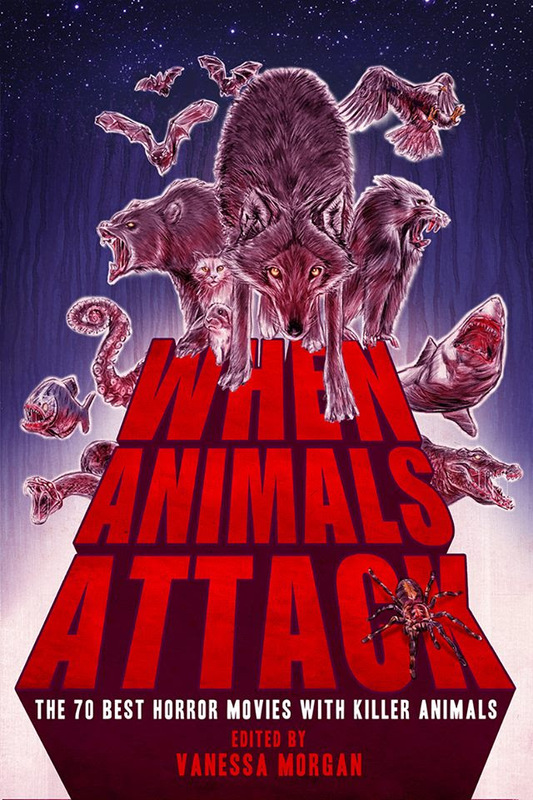 The essays were written by “[leading] horror writers and filmmakers”, who were each asked to write about “one of their favorite ‘animal attack’ films” in detail. The films range from the heights of The Birds (US-1963; dir. Alfred Hitchcock) and Jaws (US-1975; dir. Steven Spielberg) to the ludicrous depths of Beginning of the End (US-1957; dir. Bert I. Gordon) and Sharknado (US-2013; dir. Anthony C. Ferrante). Published by Moonlight Creek Publishing, When Animals Attack may not include ALL the best animal-attack horror flicks, but its 402 pages sure include a decent slew of them. The essays are written in different styles and take various approaches that reflect the individual authors responsible. It makes for both informative and entertaining reading, and will be a useful reference volume for those seeking something new to watch in this sub-genre — or for those who value being reminded of a piece of animalistic cinema they’d forgotten. You may even learn something new about your favourite animal-attack epic. As you may or may not notice, Robert Hood (whose undead backbrain is the creator of this blog), contributed an essay on Russell Mulcahy’s 1984 rampaging wild boar flick, Razorback. It’s a favourite of his and definitely at the positive end of the cinematic quality scale. Be sure to check out When Animals Attack: The 70 Best Horror Movies With Killer Animals. Vanessa Morgan | When Animals Attack. US$17,99 | ISBN: 978 90 245 7478 0 | 402 pages | paperback & Kindle. Available from Amazon.com, Amazon UK, Amazon FR etc. Source: Vanessa Morgan, Press release, the book itself. This entry was posted in Books, Horror, News and tagged Razorback, Venessa Morgan, When Animals Attack. Bookmark the permalink.